The race for who will come to the market with an auto-piloted car is heating up again. 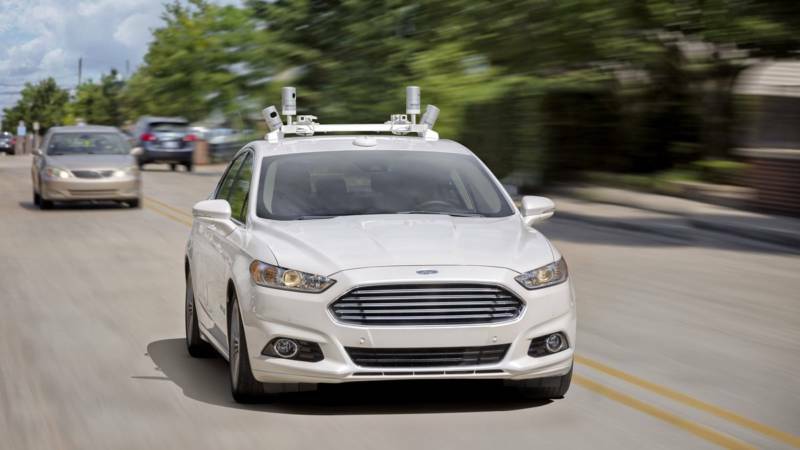 Ford has announced that it will have a fleet of autonomous cars on the road by 2021. The driverless vehicles will be available for ride sharing. It's an ambitious goal. The company said it will more than double its team devoted to developing autonomous driving, and invest even more money in its Silicon Valley campus. Ford's CEO Mark Fields has said that the company will triple its investment in the technology which includes currently available help with parking and avoiding traffic jams. The program that Ford announced is not quite a self-driving car in every garage. The announcement is for vehicles that have Society of Automotive Engineers Level-Four driving automation. SAE Level Four is when the car is self-controlled in all but a few environments such as severe weather. These Level-Four cars would likely be in closed systems or fixed routes. Karl Brauer with Kelly Blue Book says, "The time frame for privately owned, fully autonomous vehicles, capable of operating anywhere and anytime, remains at least seven to 10 years away." Fields says he's not closing the door on potential partnerships. Ford and Baidu Inc., the Chinese Internet behemoth, announced that both companies jointly invested $150 million in Velodyne, a Silicon Valley company that specializes in sensors. Already Silicon Valley and the auto industry have been in a dating frenzy looking for long-term partners to help develop the technology behind a self-driving car. Volkswagen spent $300 million to get a piece of ride-hailing company Uber's European rival Gett. General Motors spent $1 billion to purchase Cruise Automation, as well as investing in ride-hire service Lyft. Meanwhile, Toyota invested in Uber. Randy Visintainer, the head of Ford's autonomous vehicle program, says the company is ready to meet the challenge of putting a driverless car on the road. "Our mission is to make transportation affordable, efficient and safe," Visintainer said in an interview with NPR. "The Model T delivered in its time and autonomous vehicles have the potential to do that in the 21st Century." Visintainer shrugged at the idea that Ford is in a space race of sorts to put an autonomous vehicle on the road. He says that the team had "enough confidence in our development of the technology, the understanding of how to make the vehicles in volume that we would make this claim." Ford's engineers may be confident, but are riders? The announced plan would have cars without not only drivers but obvious vehicle controls. Visintainer says he understands the public's uneasiness about autonomy. He says the company is looking for ways to convince the public that self-driving cars can be safe. "It's going to be an education and a journey, being transparent and open about the progress we're making, and how we're doing is a key part of that." Analysts say discussing the technology is a move to placate the concerns of Wall Street. General Motors, Google and some of Ford's other competitors have spent the year making announcements and investments in advanced technology. Michelle Krebs with autotrader.com says GM has been grabbing all the headlines recently "and Ford can't be happy about that, especially as some Wall Street analysts have wondered if Ford is falling behind in future mobility." Ford's Mark Fields has said Ford has been setting the pace.